Oversize piston kit, fits 1996 and later KLR650. Forged, lightweight, 2.5mm over stock. Premium rings. Camshaft bearing bolts. Better quality than the OEM parts. Set of 8.
replacement o-ring for output shaft collar. Kawasaki part. Replacement seal for countershaft, fit into case behind countershaft sprocket. Kwasaki part. Cylinder boring and honing for the 685 piston kit. Read full description before ordering. Cylinder work for the 719 or 705 piston kit. Does not include liner. Dowels used all over the klr650 engine. Used as side case locators, and top and bottom of cylinder, and camshaft bearing locators. Aluminum washers for 12mm drain plug. replacement plastic enricher nut, or choke cable nut, for the factory carb. Head gasket, Kawsaki original equipment. Stock (not cut) , so it fits up to 1mm oversize. Head gasket, Kawsaki original equipment. Cut for over size bore up to 692. Refurbish your good usable cylinder head. Oil filter bypass tube. Often lost, thrown away with the old filter. You need this in the engine to make sure the oil passes through the filter. Only fits one way, small end into the engine first. Rear hub, rubber damper. This is the rubber part that fits between the sprocket carrier and hub. Kawasaki OEM part. The internal parts needed to rebuild the water pump. O-ring, mechanical seal, and oil seal. You would also likely need a waterpump gasket and clutch cover gasket. Oversize piston kit, fits all years KLR650. Forged, lightweight, 1mm over stock. Premium rings. Oversize piston kit, fits 1996 and later KLR650. Forged, lightweight, 3.00mm over stock. Premium rings. 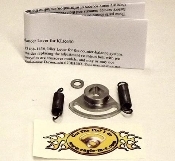 Oversize piston kit, fits 1996 and later KLR650. Forged, lightweight, 5.0mm over stock. Premium rings. Everything you need except standard tools! Basic lever kit - the famous Eagle balancer adjustment lever (doohickey). High strength heat-treated aerospace grade stainless. No springs are included. Special tools req'd. Rotor bolt, genuine OEM Kawasaki. Torsion spring for the klr650 balancer system. Offers several advantages over the factory style extension springs: longer adjustment range, captured on install - spring body can't fall into crankcase. Rotor puller, made by Eagle! High strength alloy steel. 19mm (also fits 3/4 scket) hex. Don't use those pullers made of soft screw stock, use the good stuff! Rotor holder wrench used during the lever/doohickey upgrade. Use during rotor bolt removal and with rotor puller to remove rotor from end of crankshaft. Use during install of new rotor bolt. Non-magnetic. Design makes it harder to slip and damage rotor. left side inner gasket, genuine OEM Kawasaki. Left side outer gasket. Genuine OEM Kawasaki. 1.5" bar risers. Machined aluminum, silver or hard black anodized. Exhaust crush gasket. This is the copper gasket between the cylinder head and the exhaust header. Remember to keep the nuts tight - check the at 100 miles and 500 miles.